The temple’s own history book has it that the temple was started by the High Priest Gyoki under the order of Emperor Shomu during the Nara era (710-794 AD). 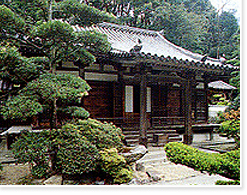 In the residential area, the temple grounds are peacefully surrounded by the forest of old trees and bamboo thickets. On the Kintetsu Nara Line, please get off at Ikoma station. From there please take Nara Kotsu bus to Tawaraguchi Hanna Central Hospital stop.